This time around the lovely folks at Stitch Fix sent me quite a few fun contenders! I’d love to hear what you think I should keep. 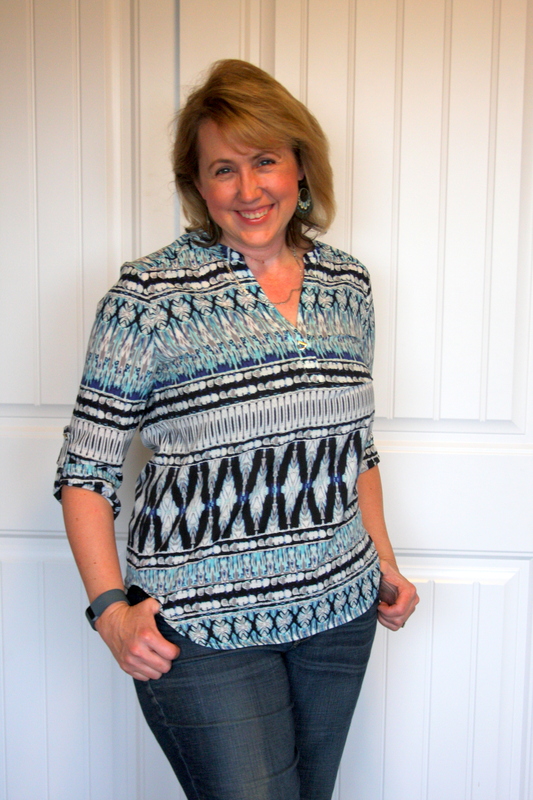 Next up is this zigzag patterned top, which I like quite well. One of my daughters thought it looked fancier than I usually wear, and it is a silky dressy-feeling material. But I think it would be nice for a lot of occasions and I like that it looks fine with jeans. Next comes this floppy navy sweater. It is heavenly-soft and very nice and warm. I am not 100% sure about the style but I think it is more flattering than the last sweater in a similar style that they sent me. And did I mention? So soft and warm. I feel like I am cozying up in a snuggly bathrobe when I am wearing it. The question is– does it look ok? Or tent-like? And if it is tent-like, do I even care… because, hello, cozy! 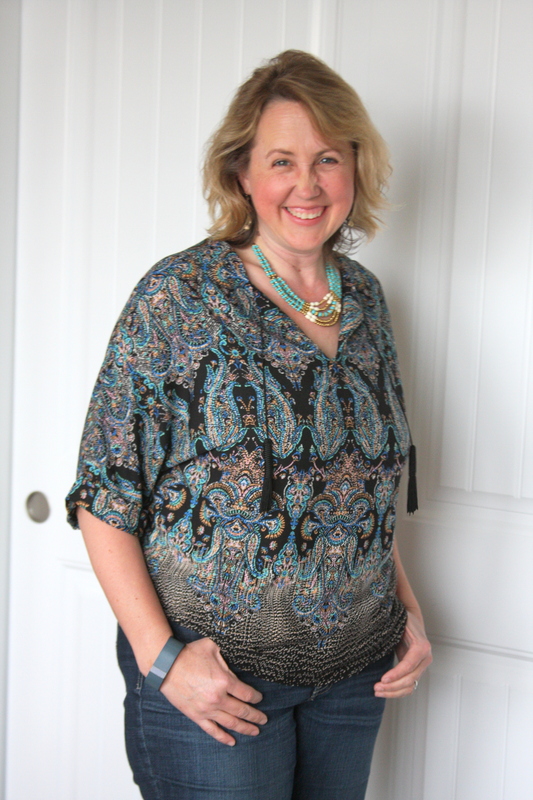 Next up is this adorable boho-style top in turquoise and black. My daughter Emily laughed when she saw this one, and said, ‘Wow, do they ever know what you like!” It is soft and silky, but just a little less fitted than the blouse higher on the page. Love, love, love it. To make the turquoise top even more fun, they also sent me a turquoise necklace as my fifth item. Such fun! So what do you think? Which items should I keep? Once you’ve sent them your info, you can order a fix as often or as infrequently as you like. Each fix consists of five items for which you pay a styling fee of $20. That $20 styling fee applies toward any item you keep. Items cost on average between $30-$70. Keep what you want, and send whatever you don’t want back in the prepaid envelope that comes right along with your fix. Easy peasy. Click on my referral link to order a ‘fix’ of your own. For extra fun, when you sign up and refer someone else, you’ll get a credit that applies toward your NEXT fix. What fun! Absolute yes to the first top! Lovely and very flattering. The sweater is fun and cosy and I’d say keep it if you enjoy it. The second top is definitely you and pretty, but not as flattering as the first top. The necklace is fun, but possibly pretty similar to something you already have? Black leggings, especially for occasional wear under a skirt, can probably be found more affordably elsewhere. What a fun collection of items! DEFINITELY keep the first top. It’s lovely on you! Not a fan of the sweater. 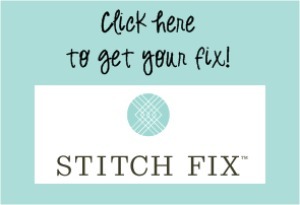 Love your Stitch Fix posts. I agree! The first blouse is a keeper and so versatile. You can wear that with nice pants for a dressier look or jeans for a more casual look. Keep the first and the sweater. 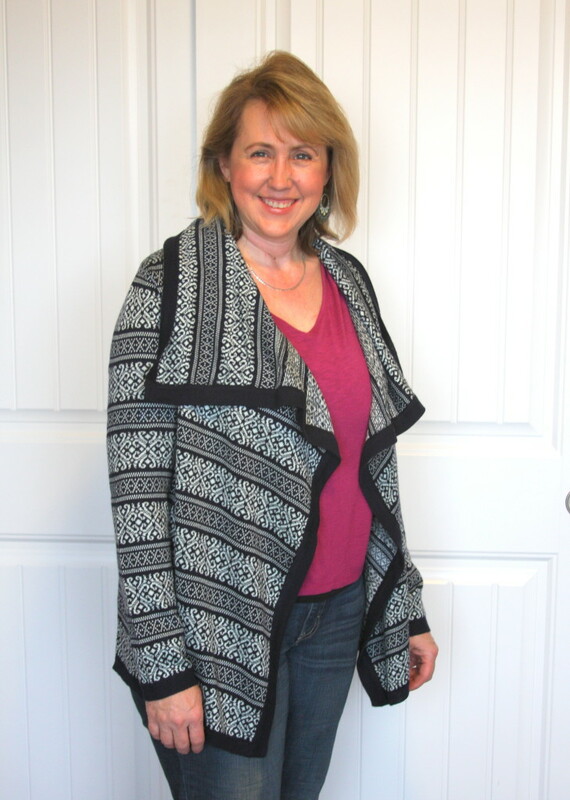 That sweater will work with so many things and keep you warm and cozy too. The first top definitely yes, the sweater sound like you love it…I like to have a button. The second shirt while the style of the shirt isn’t as flattering, I think the print they used isn’t good. The heavy dark color is right at your breast area and makes that whole area look bigger. The necklace goes well with that shirt but I’m not a fan of the gold, but the turquoise color I love. I think the first top is a lot more flattering than the second one mainly because of the cut, but the way the print is done on the second one, like Jeri said, also doesn’t work well for you. The sweater looks cozy, but I would want a way to fasten it, and I think it will get dated looking pretty quickly. The first top is absolutely lovely on you!! Nice cut, nice colors, very flattering! Everything really does look quite nice though! I really do like the boho tassel shirt as well. If I had to choose one out of those two I would choose the first shirt because that cut is absolutely amazing on you! I liked the zig zag patterned top You can use you turquoise necklace with this zig zag top. That will look good also.